In Kimberly Chrisman-Campbell’s new book, Fashion Victims: Dress at the Court of Louis XVI and Marie-Antoinette, the author dives into the world of high fashion and high society at a critical crossroad. Extreme luxury and opulence gave way to revolution in the late 18th century and as we've learned in this interview with Chrisman-Campbell, it made for a fascinating time in the world of fashion. Here’s why. 1. Louis XIV understood the power of clothing. Marie Antoinette has the lasting style legacy, but it was Louis XIV, who ruled in the 17th century and passed away in 1715, who really pushed the agenda (and let us not forget, he wore red heeled shoes). The king had a great fondness for fashion and expensive goods, and thought that prioritizing such things made good economic sense. The French style industry grew to be big, powerful, and efficient. Louis even established a system of trade guilds, called corporations, designed to set standards, regulate the industry, and provide structure. Every profession within the business, from tailors to dressmakers, had a union which provided organization and power. At a time when the wealthy loved to exhibit their wealth, Louis fed into the culture by implementing etiquette standards which called for costume changes throughout the day. 2. Anything could become fashion inspiration. French brothers Joseph-Michel and Jacques-Etienne Montgolfier invented the first hot air balloon in 1783. A bag of hot air might not seem a likely source of fashion inspiration, but inspire it did, with the industry hoping to ride the coattails of the popular innovation. Montgolfière even became a term in hair styling. 3. Fashion magazines came out every 10 days. If you think it’s hard to keep up with the trends now, imagine if Vogue was published nearly every week. In the late 1700s, fashion magazines managed to make the rounds despite having a narrow group of subscribers in the most elite circles. Servants would then read the latest news, pass the periodicals around, and perpetuate the already fast moving fashion cycle. It’s unclear how the media got access to the royals to report on their ever-evolving styles, and in fact, when comparing the physical records with written accounts, it seems their insider information might have involved a bit of imagination. 4. Everything was outdated immediately. Hatmakers, or milliners, served a hugely important role in 18th century fashion, both in defining the look of the time and propelling it forward. The marchandes de modes gave their stylings topical names to set them in a particular (and short) place in time. Any new accessory or trimming had a ticking clock on it from the moment it was sent out into the world. This “planned obsolescence,” as Chrisman-Campbell calls it, gave milliners incredible power over the industry and ensured a steady stream of clients. 5. Everything was custom, and everyone was a designer. Individuals would work with hatmakers, dressmakers, and sometimes even fabric salesmen to compose one-of-a-kind items—yet another way that milliners made their mark on the look of the time. Marchandes de modes became powerful in the context of the guild system because, while dressmakers could only trim a dress with the same fabric the dress was made of (rules were rules), a marchandes de modes could trim it with anything (but not sew a dress—at least not legally at the beginning). They provided variety and customization that made them highly sought after. Secondhand clothing was fairly regular among the wealthy, and most people were wearing pieces that had previously been owned twice or even three times before. Flea markets made for popular destinations, and Marie Antoinette's ladies-in-waiting were lucky enough to score her hand-me-downs, which they would wear or sell or make into dog beds. The fact that servants often wore the garments their masters had been sporting recently speaks to both the importance and the disposability of fashions at the time. The industry was moving at breakneck speeds. 7. The pouf was more than a look—it was a statement. The iconic pouf stylings of the time—with their feathers, flowers, ribbon, lace, jewelry, fruit and other miscellanea—weren’t just about looking cool or displaying wealth; they were meant to be a reflection of personal and cultural events, or even newsworthy occurrences in science or politics like the American Revolution. Topical fashions extended to fans, men’s waistcoats, and even gowns. 8. Rose Bertin was a rockstar designer of the time. Bertin was a milliner who was introduced to Marie Antoinette by the Duchess of Chartres and, from there, became one of the “it” designers in Paris. She charged a lot for her work, dressed well, and even had servants and a carriage. As someone who started out in a lower class, Bertin’s ascension to life among the royals was a subject of controversy. She was also unique in that she dressed the queen as well as others, which was previously not allowed. 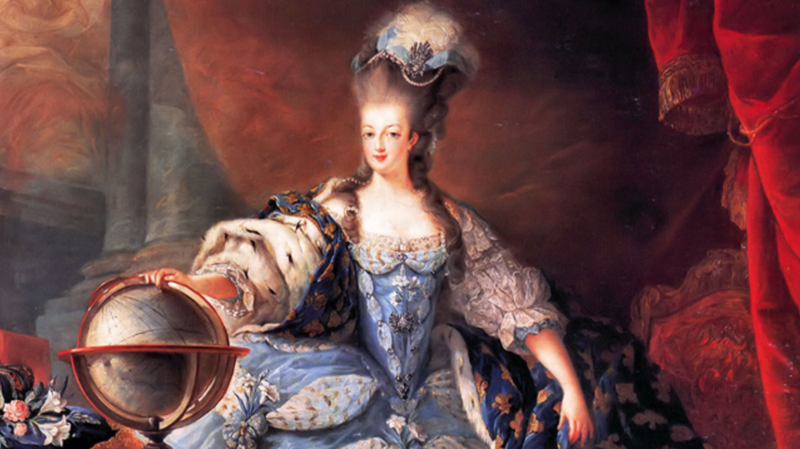 Marie Antoinette wanted Bertin to be a part of the world of fashion, which is why she didn't demand exclusivity. 9. Black was the new black. During the 18th century, being in mourning was often more about etiquette than actual grief. Widows stayed in mourning attire for a year, and it was customary for the entire court to don funeral wear if any member of the European royal family died. Black was in such regular rotation in the outfit color scheme that people got quite used to it and began to value its practicality. As mourning traditions started to fade, black became a color of everyday dress. Hundreds of years before Anthropologie was born, French nobility knew there was something desirable about the rustic aesthetic (or as Chrisman-Campbell calls it, “peasant-chic”). Luxury aprons became fashionable, in part due to the success of the 1784 play The Marriage of Figaro, which was about servants. Bertin made such aprons for Marie Antoinette, and the queen even had a model village built in the gardens at Versailles—something many high society types did at the time—so she could play dress up and pretend to be a peasant. The popularity of aprons was part of a movement toward simpler styles. Cotton began to appear, which was a nice change of pace for the lower class, who could conveniently wash the fabric while emulating the styles of the rich. But it was bad news for the embroideries and silk weavers, who would eventually ask Louis and Marie to help with their floundering business (sadly, there’s not much to be done when you’re out of vogue). Surprisingly, a portrait of the queen done by Vigée Le Brun in 1783 ignited public anger because of the simplicity of the dress. Not everyone was accustomed to the new trend at that point. 11. Everything was lost in the revolution. From the clothes themselves to the industry that had once served as a crowning achievement of the court, the world of French fashion disappeared in the wake of the revolution. Of the royal wardrobes, we can only imagine and piece together ideas of what once was from accounts and drawings. Many industry workers died or escaped, finding their way to other European cities. 12. People wore political allegiances on their sleeve. Or, rather, their head. The tricolor cockade was the look of a revolutionary though it eventually became mandatory to wear the hat or some sort of tricolor fashion during that time if you wanted to avoid conflict. 13. Napoleon eventually brought fashion back. When Napoleon became Emperor in 1804, he wanted to return to the fashionable days of Louis XVI because, much like his predecessor, he believed encouraging the industry would help with the economy. He brought back luxurious dress and helped to breathe some life back into a facet of business and society that had been all but wiped out during the tumultuous years of the French Revolution.